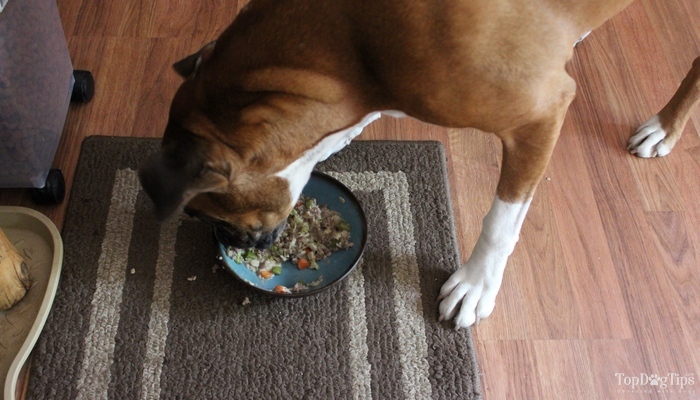 The best thing about making your own dog food is that you can add to the recipe and make substitutions that fit your dog's needs. If your pet is sensitive to some of the more common protein sources, like chicken and beef, you can use venison, bison, duck or another less common protein instead. For this recipe, I chose to use venison and a few vegetables from our garden. Making your dog's food and treats allow you to have total control over the ingredients that are used. If you want to purchase fresh, natural, organic ingredients you can do that. If you prefer to use ingredients from your own garden, you can do that too. 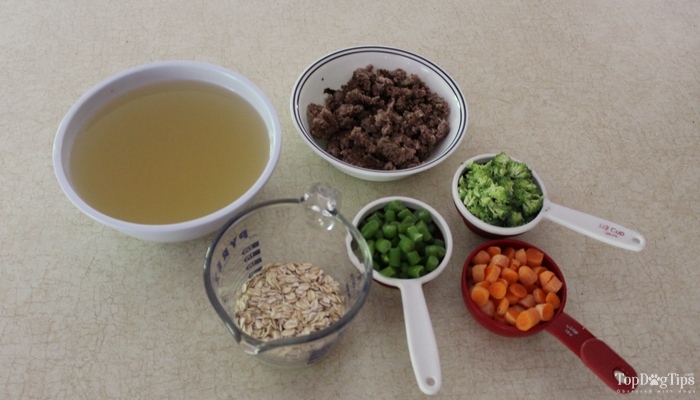 Homemade dog food is completely customizable! Just like you, your dog doesn't enjoy eating the same thing meal after meal for days on end. Making homemade food allows you to give your dog a variety of protein sources, vegetables, fruits and other nutritious ingredients. As I explain in my step-by-step video guide above, this is a very easy recipe to make. It's the food prep that takes the most work. I typically spend about 15-20 minutes prepping before I'm able to cook this venison and vegetable stew. The first step is to brown the meat that you're using. You don't need to cook it all the way through, as you'll also be boiling the stew later. Cook the meat until it's about 3/4 done in a skillet. If you're using a lean meat, like venison, you'll want to add a bit of olive oil to the skillet to prevent sticking. While the meat is cooking you'll need to chop the vegetables. I chose broccoli, carrots and green beans because they are all readily available in our garden right now. You can substitute for any veggies that you may already have in your fridge or that you can get at your local farmer's market. …there are others as well, but just be sure to check with your veterinarian or a canine nutritionist before adding any new veggies to your pup's diet. Once your meat is cooked and the veggies are chopped, it's time to mix all the ingredients together in a large pot. Turn the burner to medium heat, and add the cooked meat, broth, vegetables and rolled oats to the pot. Bring the mixture to a boil and then cook for 15 minutes, stirring occasionally. You'll notice that the veggies and oats soak up the broth. As you'll see in my video, the mixture starts out very runny, but thickens as it cooks. Once the stew cools you can feed it to your pet immediately, or store it in the refrigerator in an air tight container for up to 5 days. I explain in the video at the top of this page how I portion my homemade dog food so it is easier to serve. This also makes it easier for the other members of my family to feed our dogs without over- or underfeeding them. If you have a recipe to share, please do so in the comments below. You can also share your photos and recipes on our Facebook page! Who knows, I may even feature your recipe in my next video!